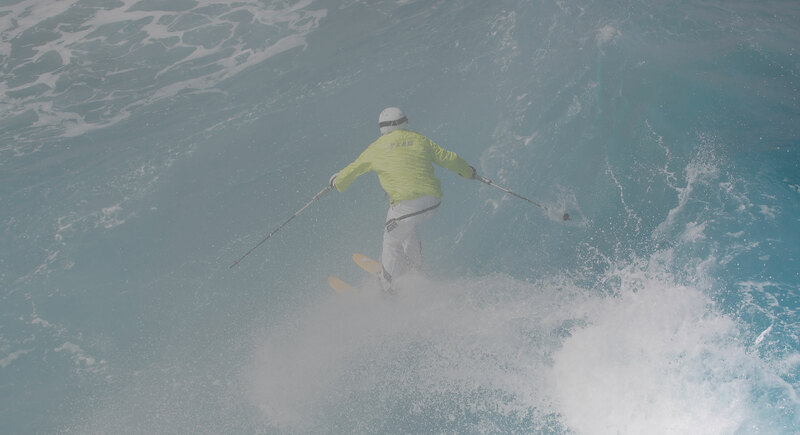 Surfing and skiing are known to everybody but surfing waves with actual skis and skiing down the piste with a surfboard, that’s something that nobody has ever done before. At the beginning there was an idea: Surfing and skiing are known to everybody but surfing waves with actual skis and skiing down the piste with a surfboard – that’s certainly something that nobody has ever done before. Why not? That’s a good question that Willy Bogner himself usually likes to answer. So he called Chuck Patterson and Quirin Rohleder to try out the whole thing. 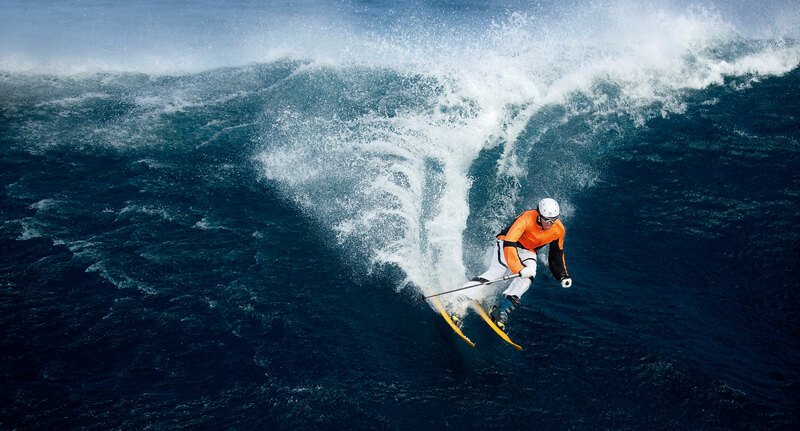 Technically challenging in the beginning, soon it worked out and two new sports were born: wave skiing and snow surfing. Chuck Patterson, age 45, is a multitalent when it comes to action. He is a pro in five different disciplines: stand up paddling, kite surfing, skiing and snoaboarding. If he is just not on his way to heli skiing, he lives on Maui, Hawaii. 1. What was your first thought when you heard about the action shooting idea? I can still remember the moment very well when Willy called me and told me about his idea. I thought: Wow, this sounds great and really crazy but also very interesting. 2. What were the greatest challenges on location? For me that was the fact that my feet were steadily tied to the skis and the linking wouldn’t open up after a fall in the water. 3. Was there a moment when you thought: Yeah, it really works! When I was surfing on the wave and wanted to make a turn I instinctively used my sticks which is basically silly but I instantly had the feeling that it was much easier. That was pretty much an aha-experience. 4. What do you associate with Willy Bogner? Everybody knows his name and he has accomplished so much and done crazy things. I like that he still has this attitude: ok, let’s try that! Quirin Rohleder, age 41, is also called „Mister Eisbach“, At the age of 13 he already surfed his first wave on the Munich river. Higher waves on the sea and a professional surfer career were soon to follow. Currently he lives in Munich and works as a sports agent. I’ve been snowboarding without tie-ups (linkings) a couple of times before and thought to myself that it would probably work out and that I definitely didn’t want to miss out on this amazing opportunity. 2. What did it feel like? It was almost like snowboarding but with a less firm stand and and totally different drive. 3. What is so appealing about pushing boundaries? If somebody like Willy Bogner offers you a chance to try out something exciting and new that nobody has ever done before, then it’s really something special.